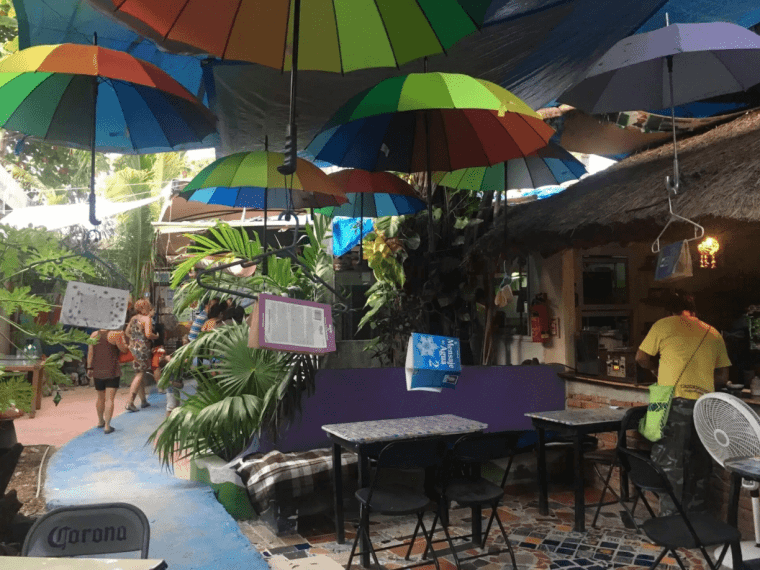 Where to eat in Playa del Carmen? The question that tickles every foodie’s brain. 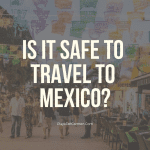 Chances are if you’re reading this blog, you love traveling. There’s sight-seeing, meeting new people, and the shameless selfie-stick-taking. But the best part of all is the food. 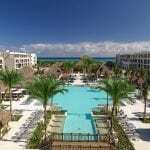 Coming to Mexico and confining yourself to the walls of your all-inclusive resort would simply be a crime. This country is BURSTING with flavor! Expect innovative usage of ingredients, mouthwatering dishes, and more than affordable prices. You’ll discover new things you never tried before and be inspired to reinvent your own flavorsome dishes at home. With some many great places to choose from, where do you start? 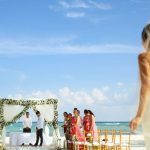 Going out for breakfast or brunch is one of my favorite things to do here at the weekend in Playa del Carmen. Hot coffee, fresh croissants, huevos a la Mexicana (scrambled eggs with peppers, onions and tomatoes), chilaquiles – what more could a girl ask for! 1. 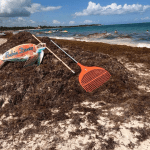 Indigo Beach – 14th & the beach at El Taj Condos. Imagine having breakfast with a view of the ocean and the sand between your toes! You can do that at Indigo Beach! There is a buffet or breakfast menu available with Mexican and American style breakfast choices. Fresh tortillas, home baked goods, freshly squeezed orange juice and more. Open daily for breakfast, lunch and dinner. 2. 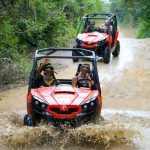 Cueva Del Chango – 38th Street near 1st Ave. 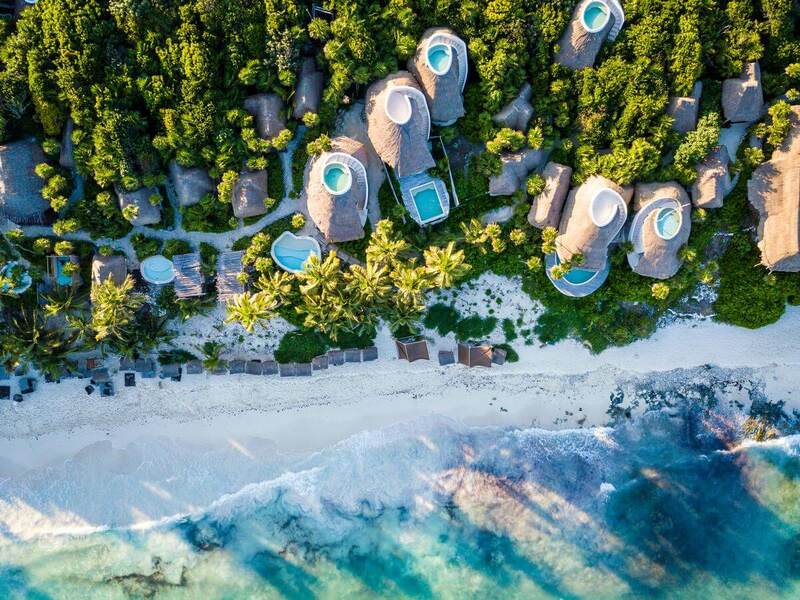 The setting alone will enchant you, encapsulated by lush tropical gardens. Here they offer a wide range of healthy breakfast options, Mexican specialties and fresh fruit juices. La Cueva is also open for lunch and dinner and has a liquor license. 3. La Ceiba De La 30 – 30th Avenue corner 20th Street. Tucked in next to the DAC fruits and vegetable market is this cozy restaurant. All their produce is provided by the neighboring farmer’s market so the result is fresh, delicious and healthy choices. They have quite a few vegetarian and vegan options available. In addition to the yummy food, they have fresh juices and smoothies galore. Open for breakfast, lunch, and dinner. Aswell as their cars, the other thing that Germans always seem to get right is their bread. Thanks to the awesome expat community here in Playa a talented German Baker decided to make this place her home. 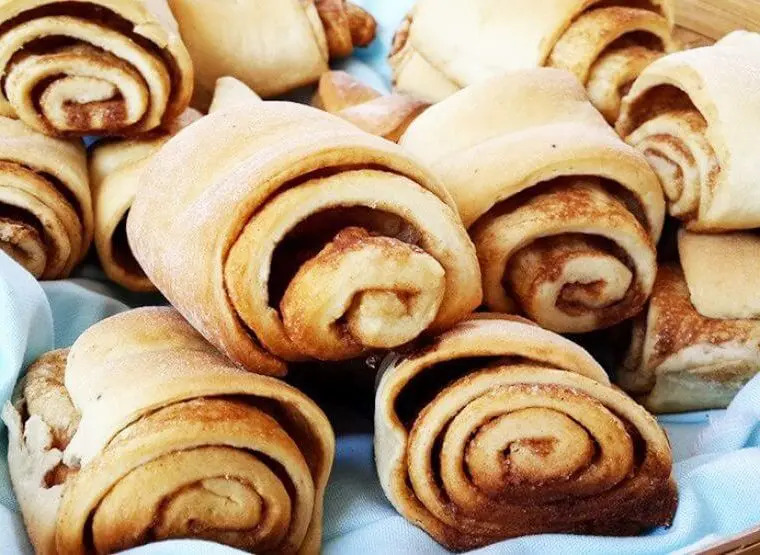 Das Brot (which means bread in English) offers up brötchen, apple-cinnamon buns, German croissants, pretzels (of course), and much, much more to provoke your appetite! 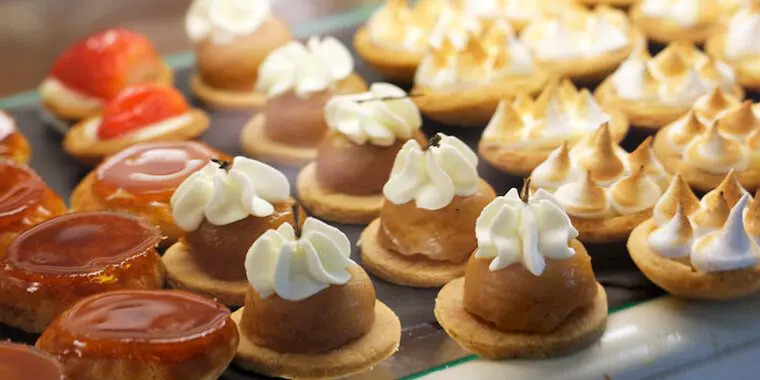 France is synonymous with poodles, the Eiffel Tower, and of course, their pastries. The rich, complex, and sultry culture is definitely reflected in the baked goods at Chez Celine! If you do visit, be sure to try their almond croissants. Oo, la la! Monday through Sunday 8:00 a.m. – 11:00 p.m. 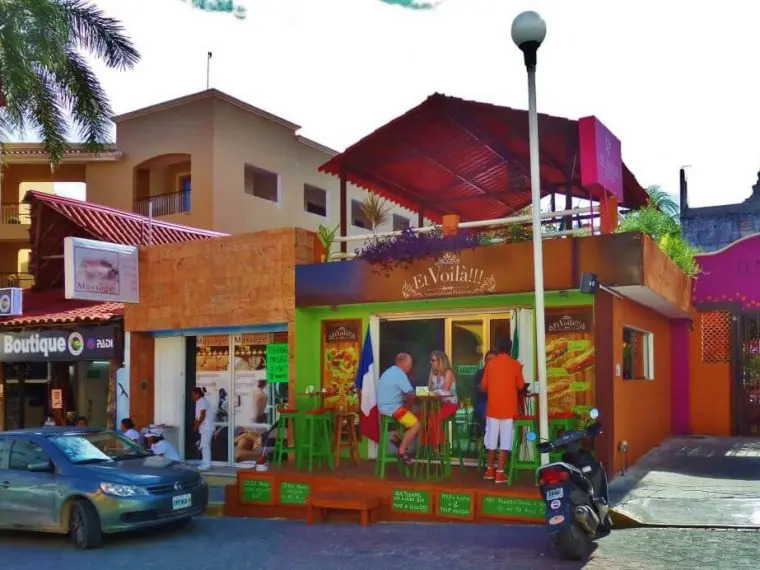 In my opinion, this café/restaurant/bakery is among the best in Playa. Mexico’s culinary identity is largely based on corn and it’s multiple uses in the kitchen. Bread has not yet reached the same exalted heights as maizin in the region. However, La Pastelería serves up baked goods that are as delicious as they are high quality. Monday through Sunday 7:00 a.m. – 11:00 p.m.
4. Shoebox Bakery -Av Constituyentes entre Av 10 y av 15 in Scotiabank plaza. 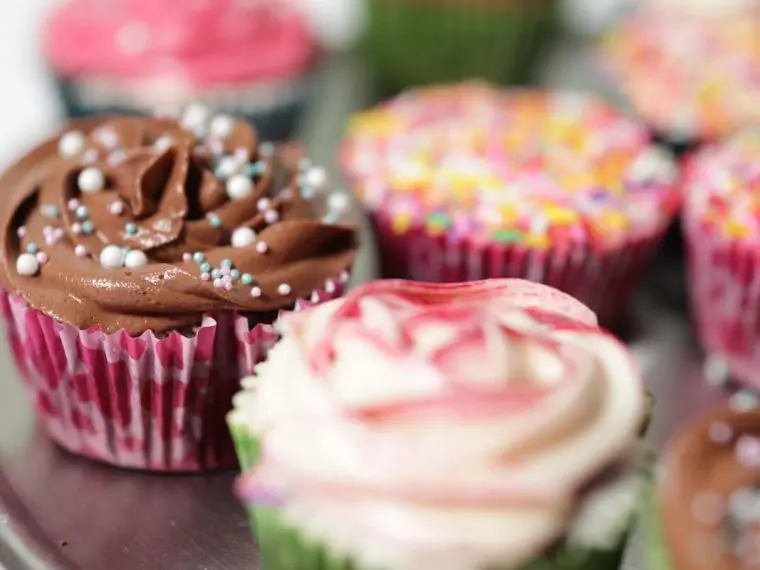 The Shoebox Bakery serves up desserts and ice cream with the possibility of home (or hotel) deliveries and the option of customized boxes for special occasions. 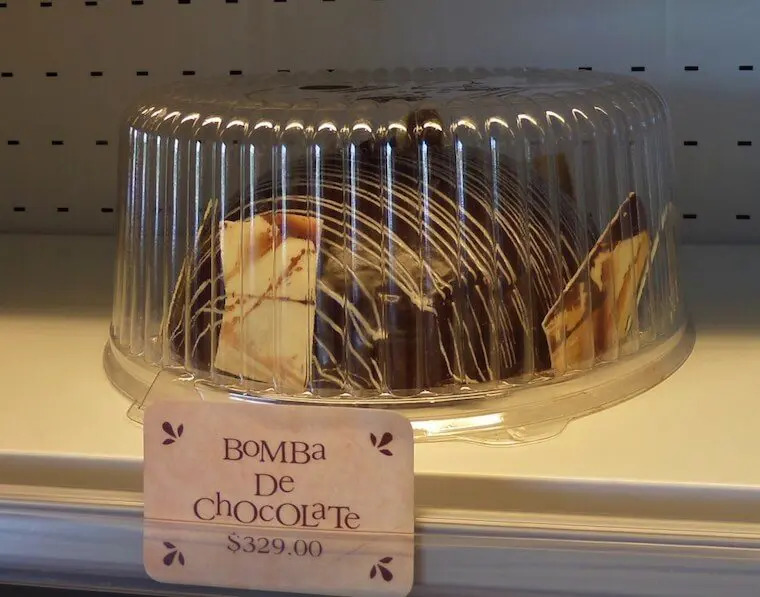 With more than ten varieties of cheesecakes, homemade bread, brownies, ice cream, cupcakes and an arsenal of delicious cakes, Shoebox Bakery has made a name for itself in Playa del Carmen, and rightly so. Their products are baked with love, passion, high quality and natural ingredients. 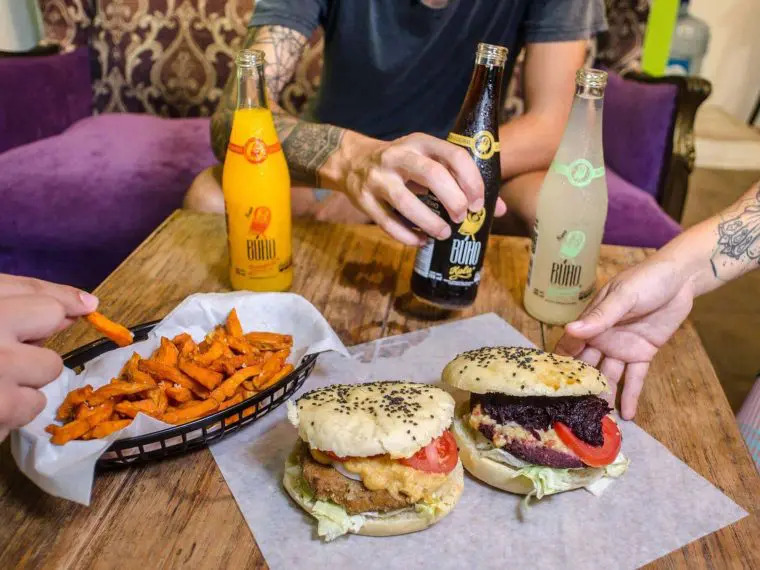 Whether you are looking for a light lunch, a sandwich or a full on meal, here are some of the best spots for lunch in Playa del Carmen. 1. Zenzi – Beach and 10th St.
Who doesn’t love an ocean view to compliment their meal? Zenzi boasts delicious options for breakfast, lunch, and dinner. They also have live bands and entertainment in the evenings. It’s a little pricey, but the view is totally worth it! 2. Cafe L’Orange – 30th street between 25th and 30th avenues. Talk about good value for money. This charming cafe offers up a menu which consists of the entree, main meal, and dessert for just $10. It’s a gorgeous relaxed ambiance, tasty food, and welcoming staff. Open for breakfast and lunch, closed on Mondays. 3. Los Aguachiles – 34th street on the corner of 25th Avenue. If you love seafood, look no further! Fresh seafood, ceviches, fish/shrimp tacos, and tostadas are served up daily. Its open air and reasonably priced. If you’re anything like me you can’t function properly without a good cup of Jo in the morning, or any time of day if I’m totally honest. 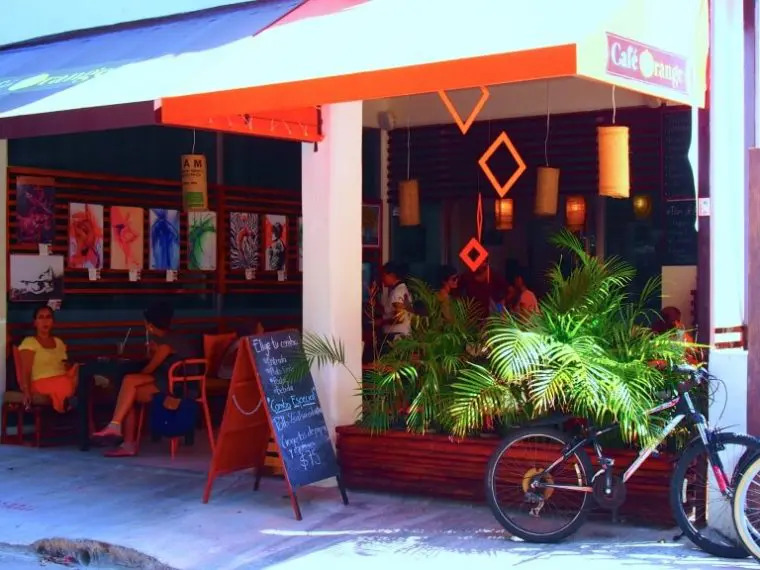 Luckily for you, the coffee culture in Playa del Carmen is BOOMING! 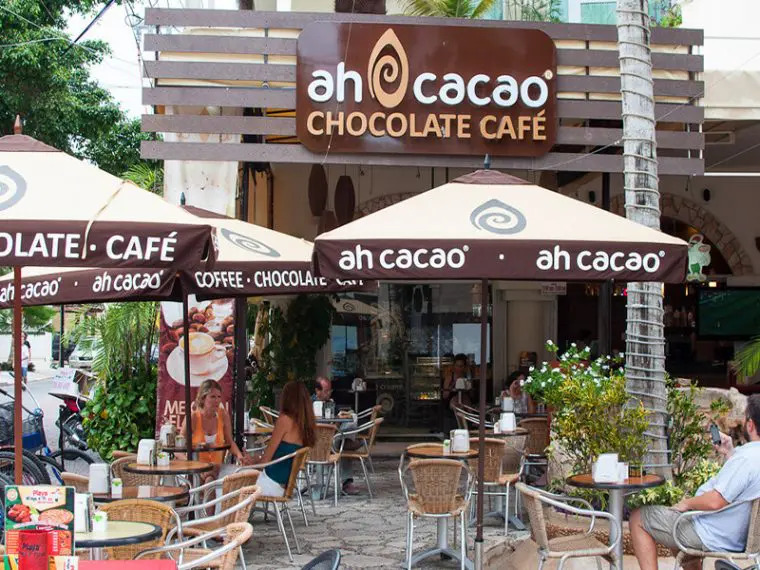 If you like good coffee, even better chocolate, and all kind of tasty treats, Ah Cacao is a favorite among locals. There are several locations in and around town, I highly recommend the cheesecake it’s divine, albeit highly addictive. Expect homemade food like pork chops, burgers, and their famous delicious pulled pork! It’s a laid-back atmosphere with super friendly staff and cheap prices. Make sure you head over to Mom’s Bar anytime from Monday to Friday from 5pm-11pm. 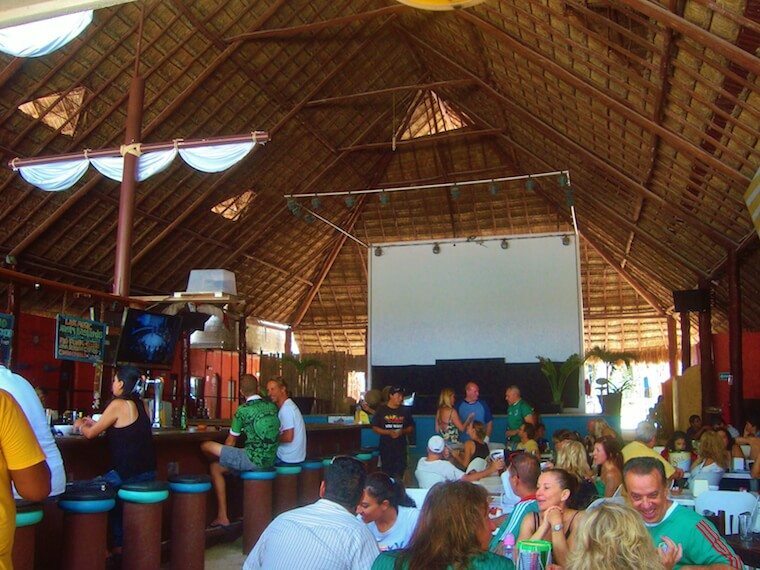 The ultimate beach bar with the biggest palapa (thatched roof) in all of Playa del Carmen. This bar is a local hang out and a fab spot for tourists, too. You can grab some ‘pub grub’, enjoy a few cold drinks, hang out at the beach club, or head ‘inside’ for some entertainment. They often have live music & various shows. How does is big, juicy, flavorsome burger tickle your tastebuds? 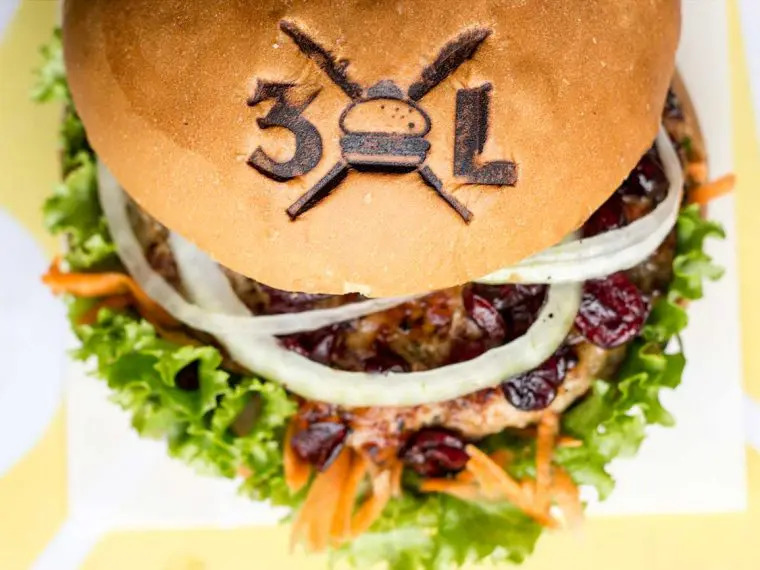 3XL serves up some awesome burger in diverse sizes of deliciousness. With a well-stocked condiment bar, you’ll turn that tasty burger into a monument of culinary excellence that’s as good as it is made to order. 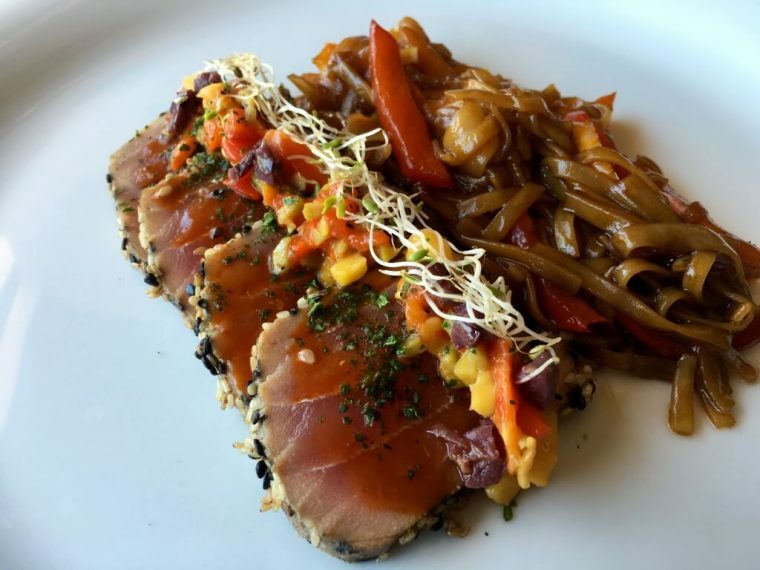 Are you craving Thai, Sushi, or Chinese? 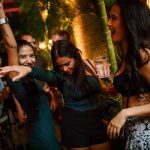 Well, you’re in luck because Playa del Carmen has got you covered my friend…Prepare for a taste sensation! Thai, Curry options, and lots of noodles. 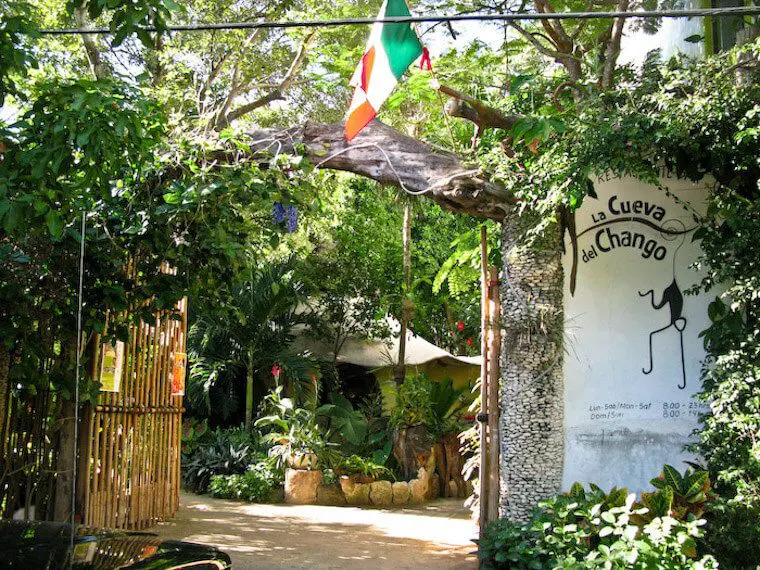 This place has been open since 2000 making it one of the original and only Playa del Carmen eateries. It’s stood the test of time because it consistently serves up delicious food at great prices. Located just off 5th avenue on 10th street, the welcoming staff, funky décor and infamous oversized daiquiris are just a few reasons to visit. Tuesday to Sunday: 1 p.m. – 11:30 p.m. 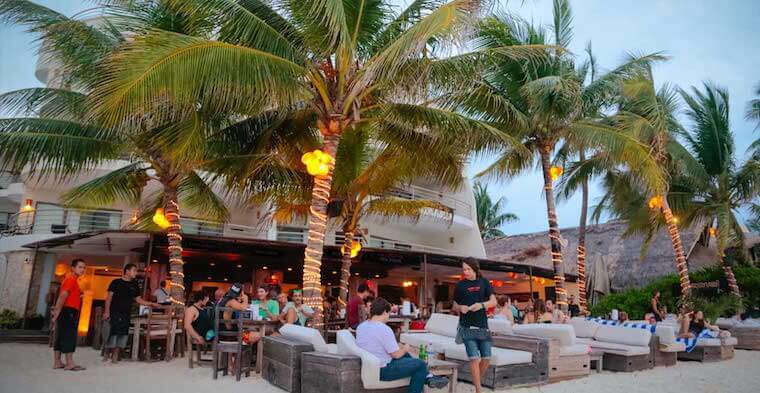 This hip restaurant is located in the Be Playa hotel. Extensive options for sushi and sashimi. Open for breakfast, lunch, and dinner, Sushi Club has weekly specials, and you can even enjoy the food from up on the Be Playa rooftop bar! What’s not to love! 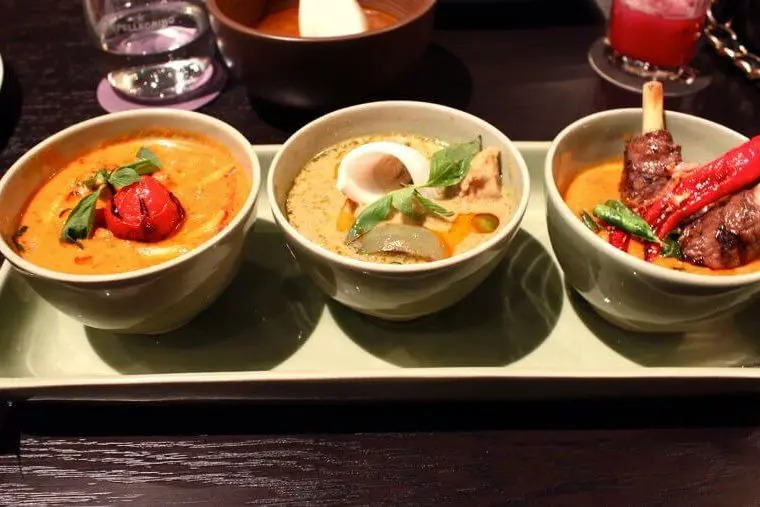 Monday to Sunday: 8 a.m. – 12 a.m.
Outside of Thailand, many places attempt to imitate the rich and intricate flavors of Thai food. Few succeed. Luckily Playa del Carmen is home to one of best Thai Restaurants I’ve ever had the pleasure of tasting. 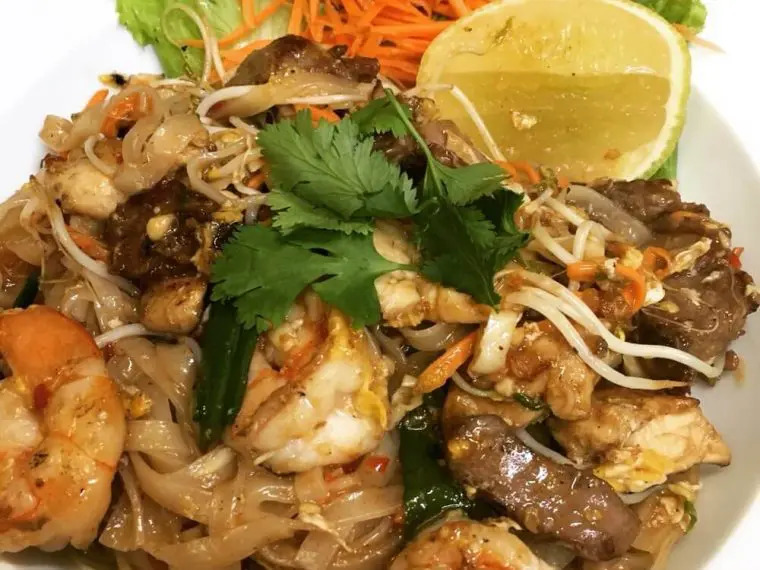 Po Thai is located behind the Quinta Alegria shopping center on 10th street, don’t miss it! 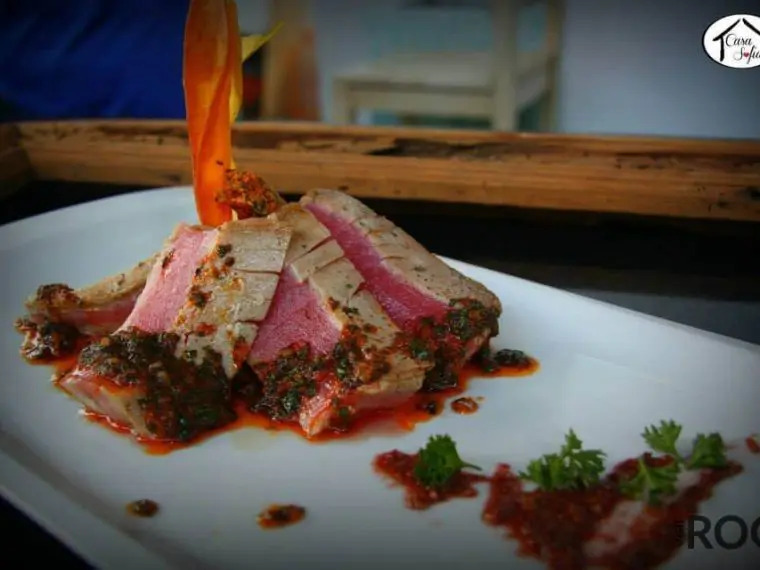 Monday to Sunday: 2:30 p.m. – 10:30 p.m.
Madre Tierra Seafood & Steakhouse is a chic Mexican restaurant located in the heart of Playa del Carmen’s Fifth Avenue. Boasting a tantalizing menu from both land and sea. Perfect for a romantic night out or a splurge on some upscale Mexican cuisine. It doesn’t matter what you order is guaranteed to be good and be sure to pair it with one of the famous Mexican wines. Argentinians are known for many things, and high up on that list next to football/soccer and tango is the quality of their cuts of beef. 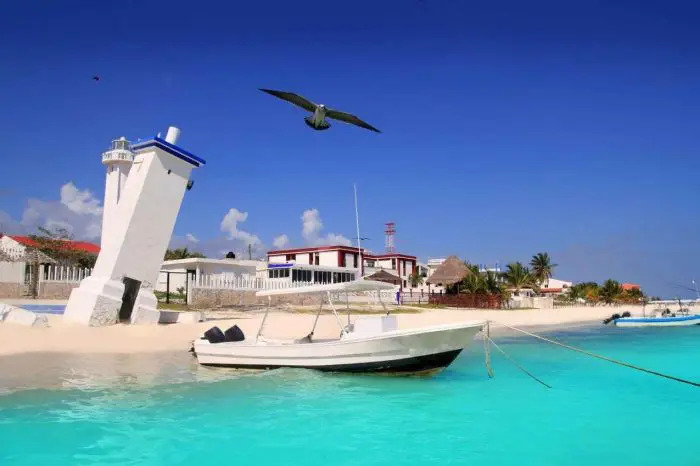 While you wouldn’t necessarily think of Argentinian food when traveling to the Mexican Caribbean, the region is actually home to a significant expat population. The result? At La Vaca Gaucha. If you are seeking a Brazilian-style meat house, look no further. Tickle your taste buds with some authentic French cuisine, you can’t go wrong. Take a short walk from bustling Fifth Avenue and voilá! La Brocherie brings some fine French flavor and flares to a cozy little joint on 15th street. 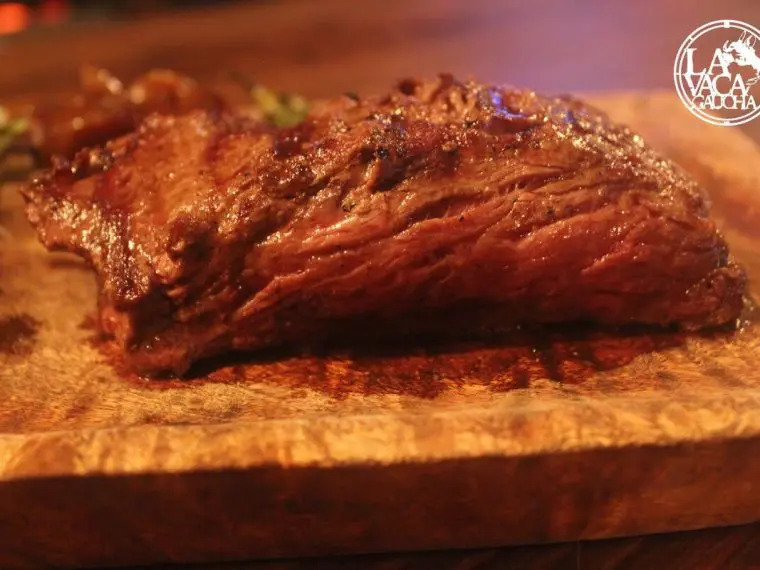 Their specialty is the roasted chicken, which is delicious in its own right, but they also serve up some wonderful beef bourguignon and other delightful French treats. Bon appetit! Et Voila specializes in made to order sandwiches with cold cuts. Choose from cheeses and fresh vegetable of your choice on French bread or a croissant. You can either get it to go or stick around and eat it there on the spot. Wash it all down with fresh juice, smoothies, or coffee. This place serves food for breakfast, lunch, and dinner. Step into the enchanting and welcoming Byblos French restaurant in Playa del Carmen. The authentic French cuisine does offer up dishes such as escargots and foie gras, but it also has an extensive menu which includes Angus steaks, risottos, seafood, fish and fresh pasta. An international wine list completes the evening. This is the perfect setting for a special occasion or a great meal out. Not sure what you’re craving, but you know you want a good hit of flavor and well put together dishes? 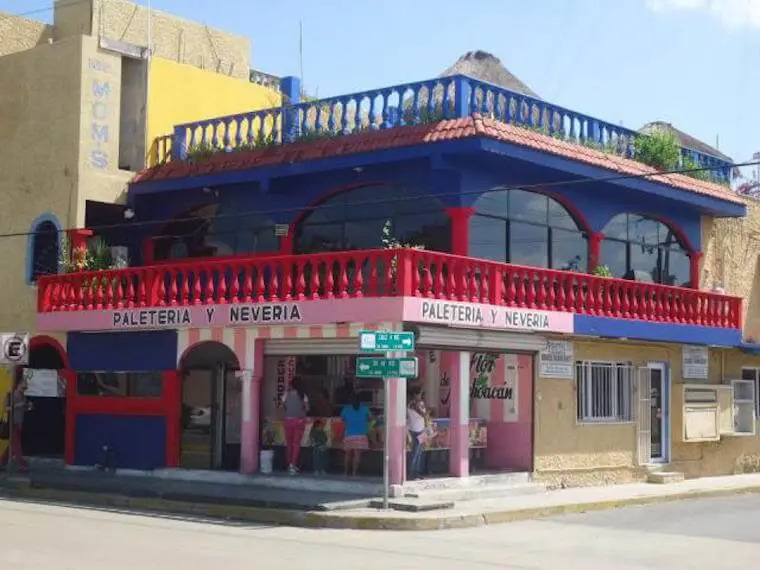 Try one of Playa’s many international restaurants. If you love Mediterranean food you’re in luck! You don’t have to take a long trip to Spain or Portugal to enjoy the rich and intricate flavors of this cuisine. Nau has perfected the art for us! 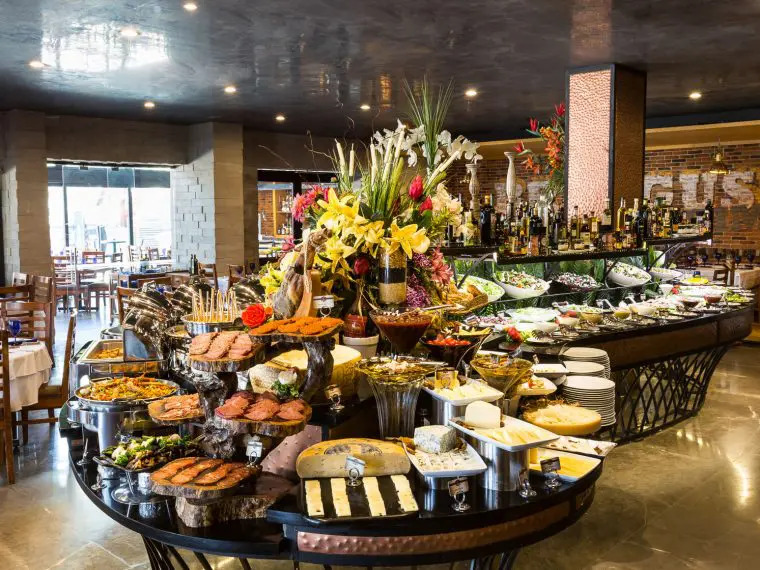 You’ll be spoilt for choice, and once you’ve tasted a few of their culinary delight you will definitely want to go back for more. 2. 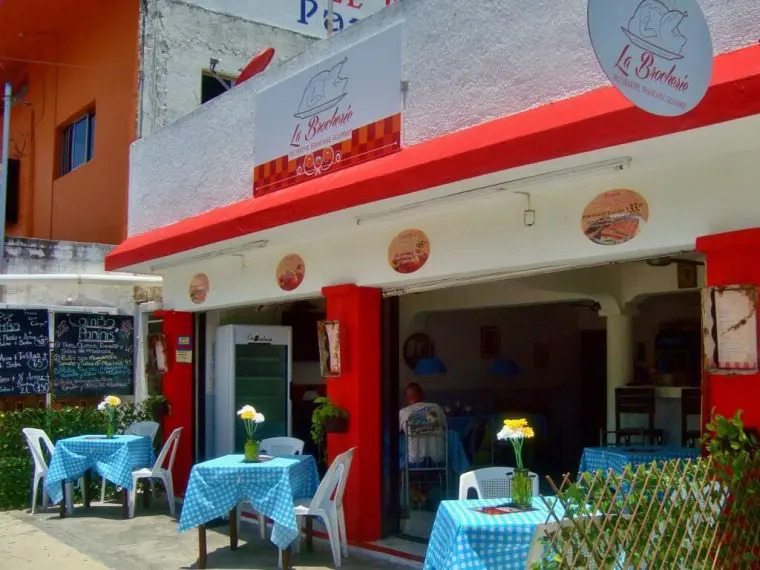 Oh, la, la– 14th bis street between 10th and 15th Ave.
Voted the #1 restaurant in Playa del Carmen on TripAdvisor, Oh Lala! 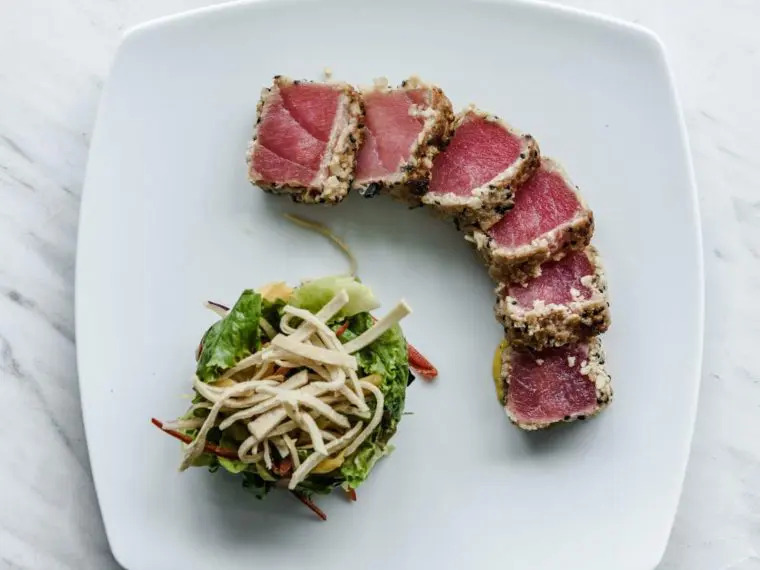 There’s a reason why this urban eatery owned and managed by Chef George and Mikaela is such a fan favorite. As if a tribute to Playa del Carmen and the diversity of its people, Oh Lala! 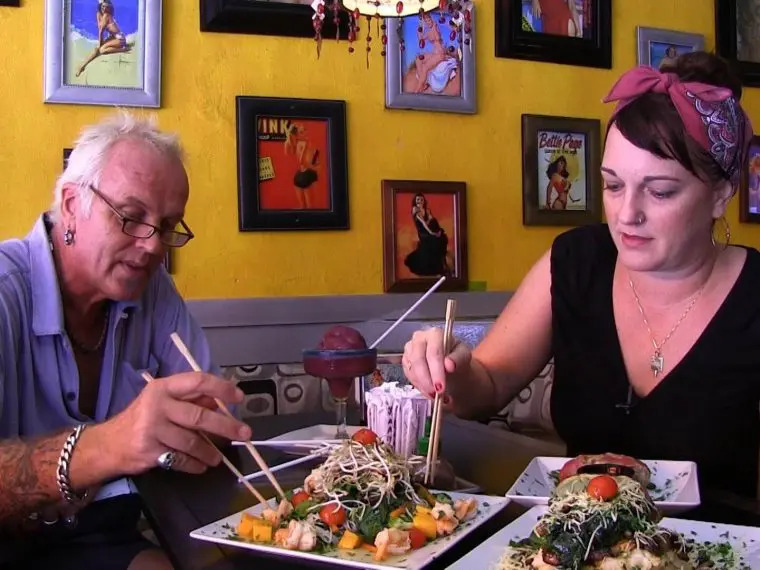 serves up some of the best international cuisines you’ll find just about anywhere. However, with just 9 tables you’ll enjoy an intimate experience so be sure to RSVP. 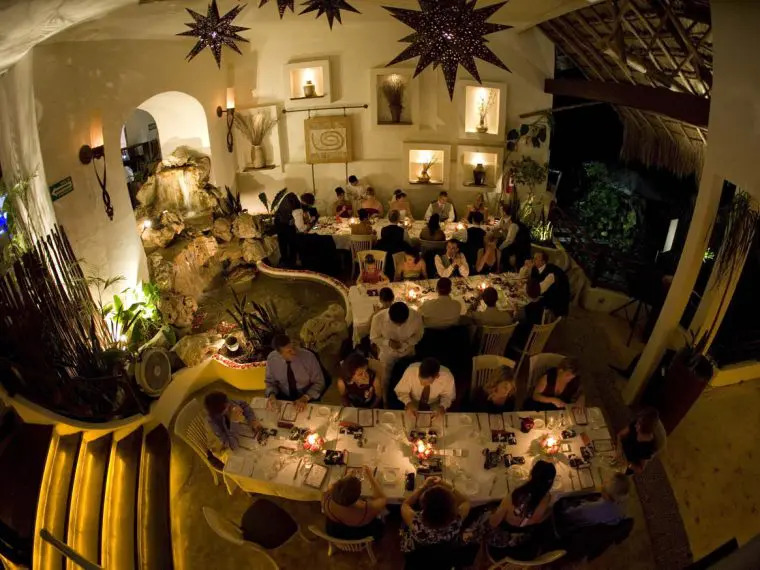 Perfect for a special occasion Casa del Agua is the fine dining choice you crave from your vacation. Here they serve up gourmet food and has a wine cellar with over 300 labels from all around the world. You will be spoilt for choice. This is the perfect setting for a special occasion, rehearsal dinner or a sophisticated meal out. Mama mia! Pasta, Pizza, great desserts? 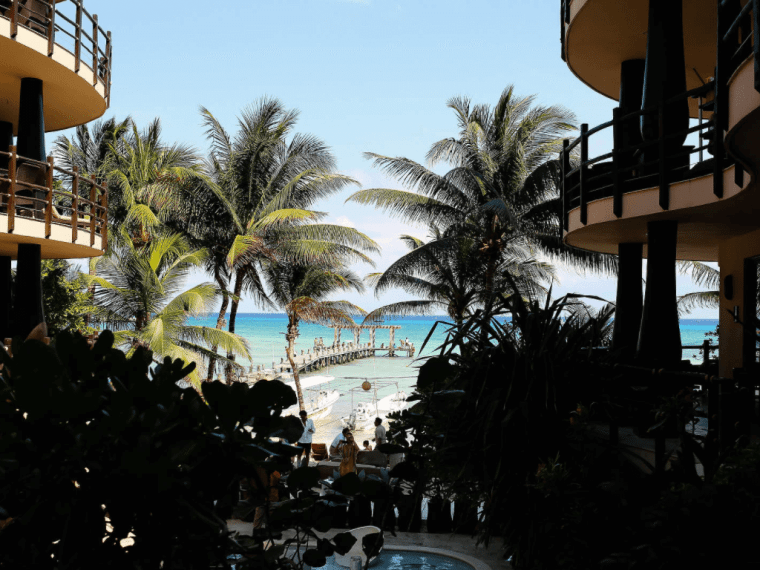 We have them in abundance here in Playa del Carmen, but here are my top 3 at the moment. The best Chicago-style pizzeria I have EVER tried. 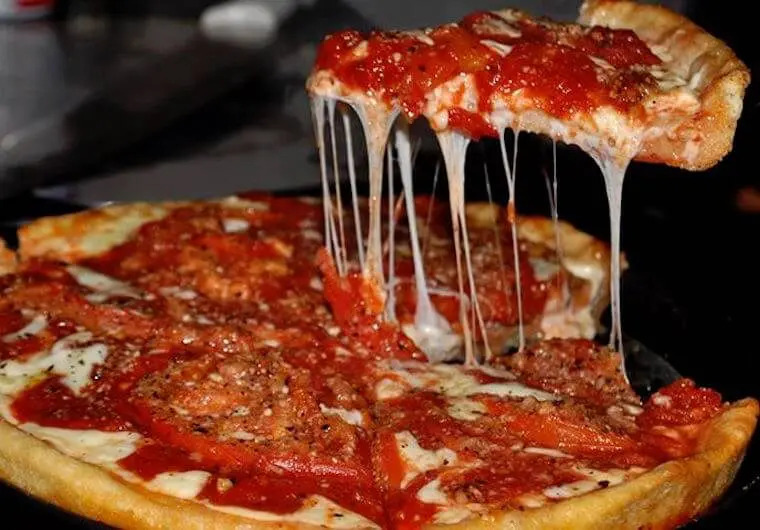 With an array of tantalizing deep dish delights to choose from it won’t be long until you realize why this place is an expat favorite! If you’re not hungry for pizza, we suggest you give the delicious chicken parmesan a try. Either way, you’ll be well fed and happy. 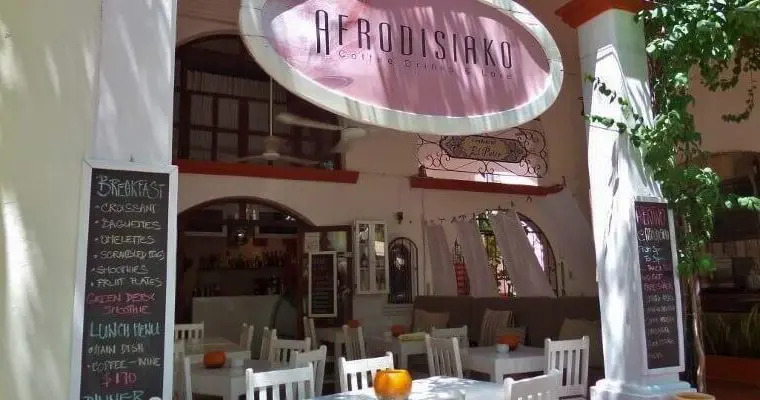 A restaurant just as flirtatious as its name, Afrodisiako offers up a creative menu of Italian/Mediterranean specialties that are off the charts. The restaurant makes their pasta by hand, employ a lot of organic goods when preparing their meals, and make exotic and delicious cocktails that entice. Sensual food for sensual people. 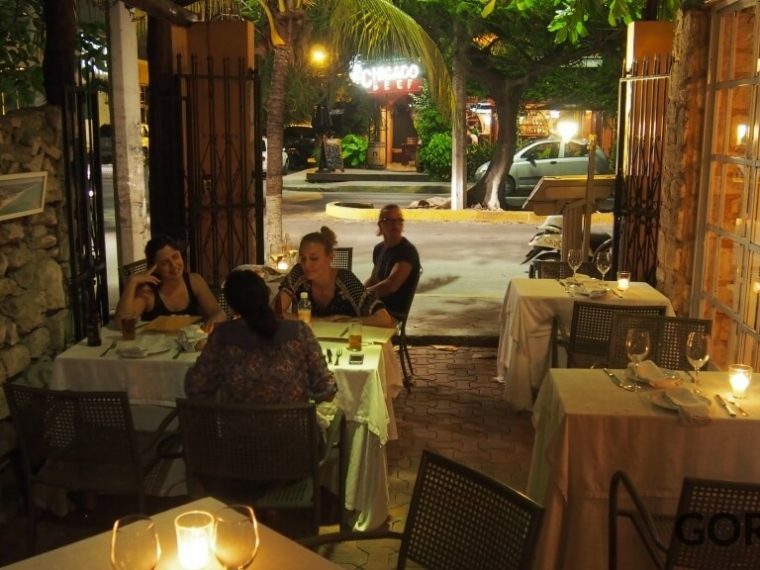 Casa Sofia has made a good niche for itself among the plethora of quality Italian restaurants in Playa del Carmen. Here you can expect fresh-made pasta at affordable prices. The restaurant itself boasts a great atmosphere and is pet-friendly. It’s quaint and romantic, not solely reliant on its food for its great reputation. When in Rome, it’s only right you do as the Roman’s do. 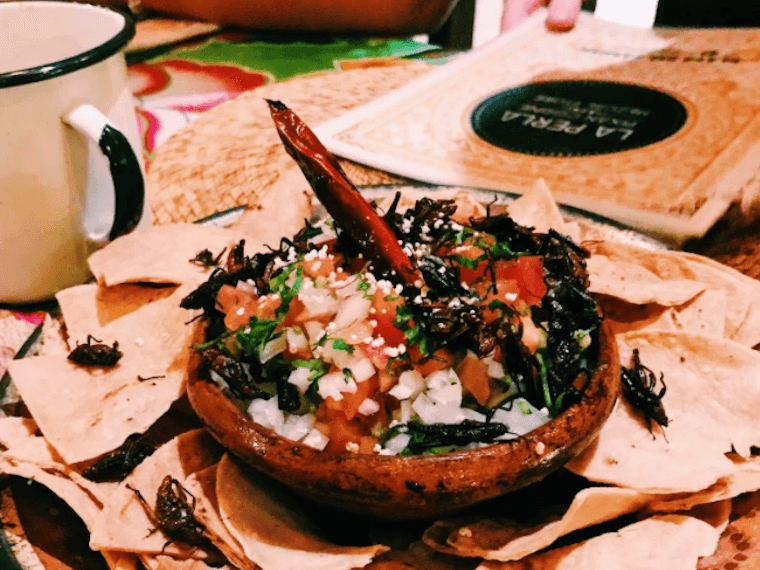 They are at the heart of Mexico’s culinary identity, so it’s only right that when you’re here you sample some of the very best. 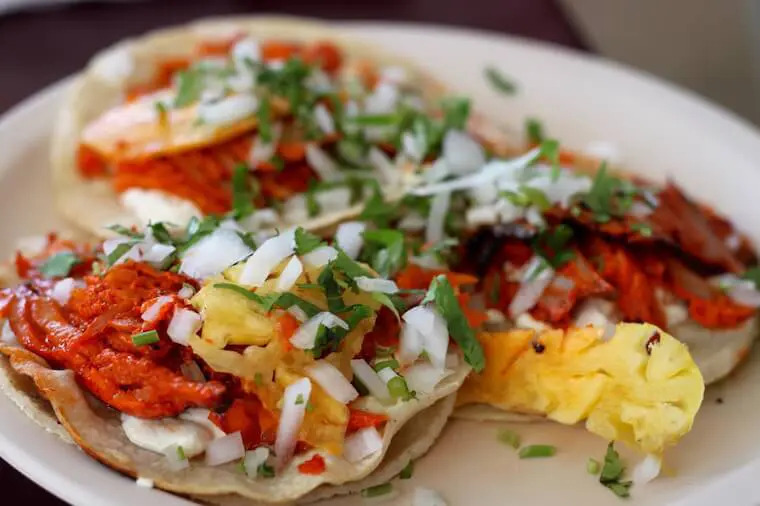 Serving up to 15 different stews a day, which can also be eaten as a quesadilla or gordita, El Gran Taco is a true taco (and flauta) heaven. On the weekends you can also order some Mexican barbacoa, paella or even Xcatic (pronounced ISH-ka-teek), which are mild chili peppers stuffed with creamy shrimp. 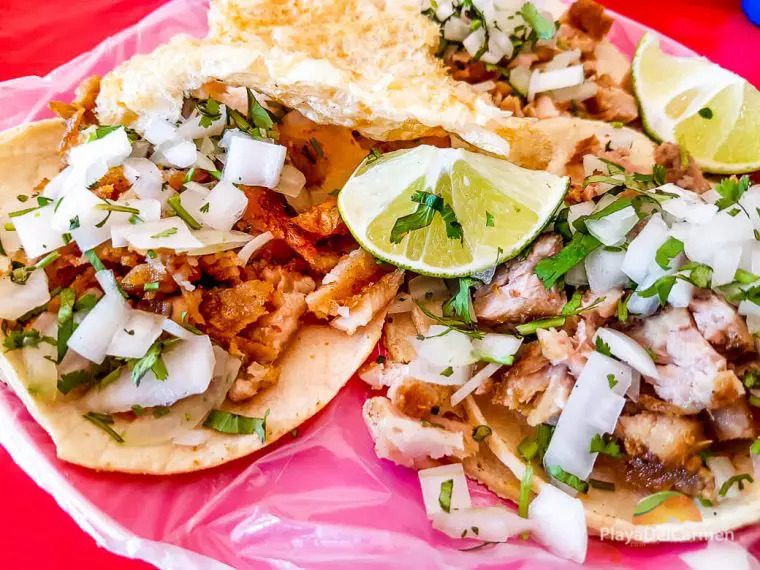 Not many people outside of Mexico are aware of the incredible variety of dishes and flavors which exist in this country, much less the amazing array of native ingredients. La Perla Pixan specializes in authentic Mexican fare. 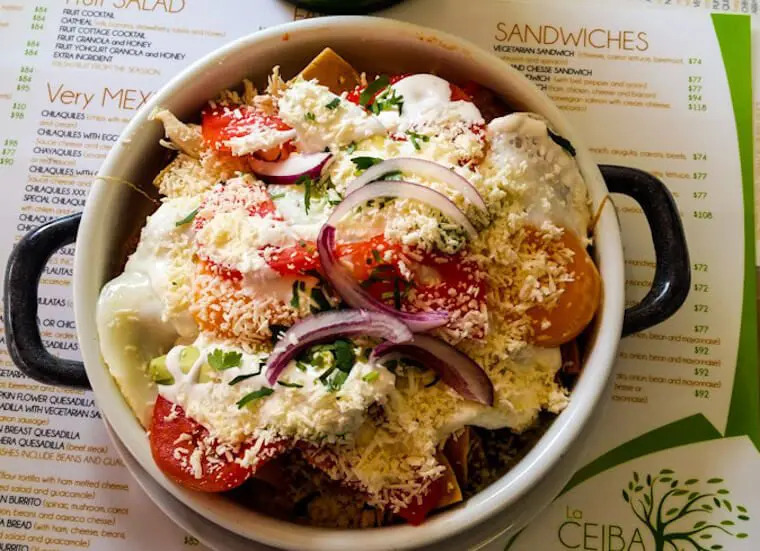 Experience the tantalizing taste of this wonderful cuisine, and don’t forget to wash it down with a splash of mezcal or pulque! 3. Aldea Corazon – 5th Avenue between 14th and 14 bis. 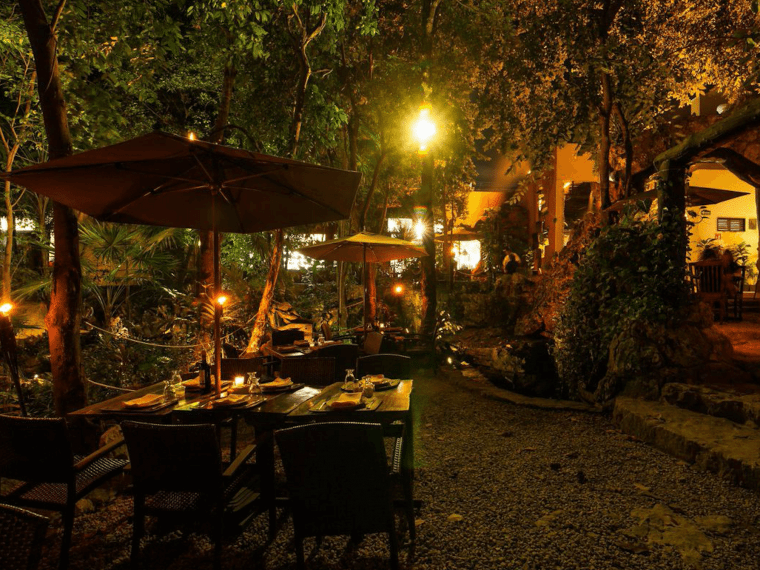 Dine in a lush garden setting around a beautiful cenote. 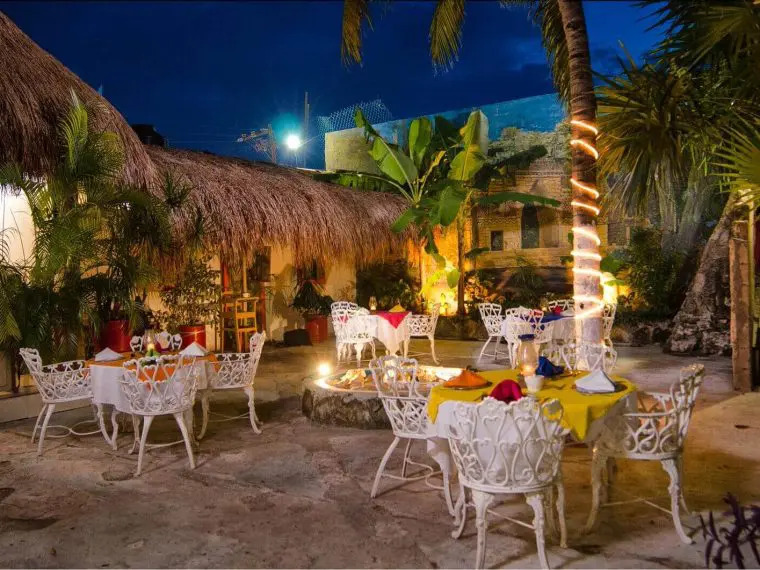 The ambiance is simply wonderful and the gourmet delicious Mexcian food is even better. Try the jicama tacos. They are open breakfast, lunch, and dinner. Read our review of Aldea Corazon. 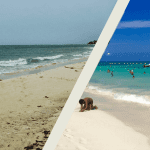 Being in such close proximity to the ocean, and the vibrant oceanic treats of the Caribbean when you’re here in Playa you can look forward to some great seafood. This restaurant offers up generous portions of the freshest seafood at reasonable prices. 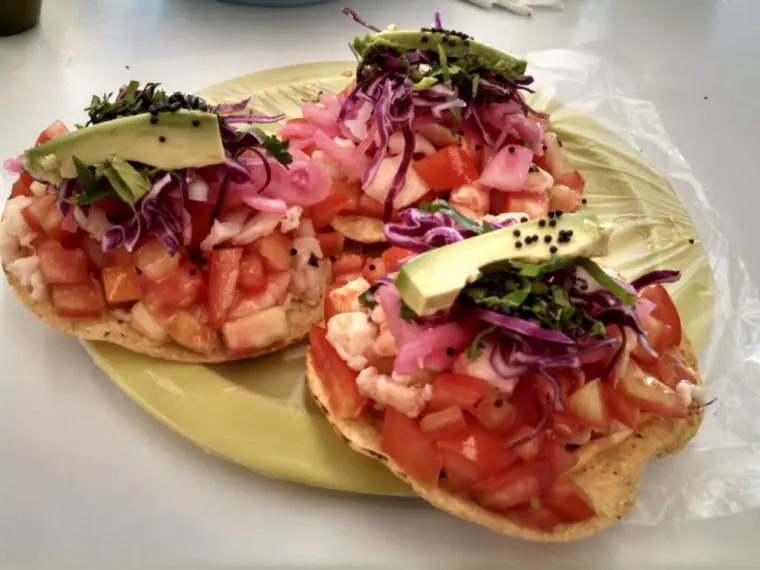 Try the specialty Mission shrimp or a fish ceviche. The menu has a wide variety of choices and the drinks are as tasty as the food. 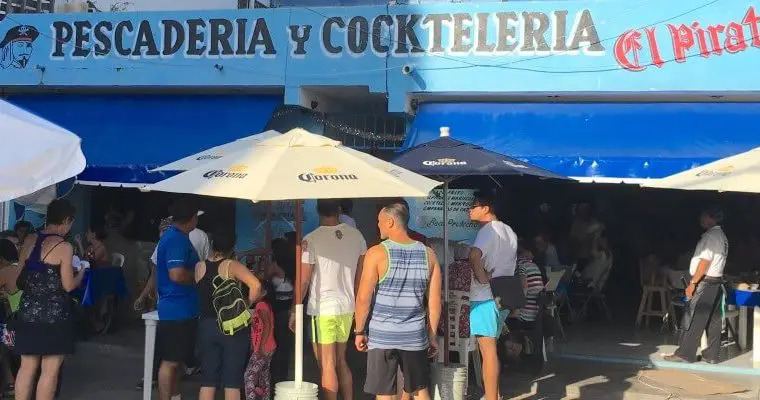 They also have a location in Cozumel. Monday through Sunday from 2:00 p.m. to 11:30 p.m. Delicious, old school, homecooked goodness whose popularity spans generations. El Pirata is one of the longest-lasting seafood restaurants in the downtown area of Playa del Carmen, and it has kept both its charms and its flavors. Be ready to wait in line to get a table as you listen to the local street musicians who makes El Pirata an obligatory stop on their circuit. Monday through Sunday: 12:30 p.m. – 8:00 p.m.
3. Blue Lobster – Located on 12th street between 1st and 5th avenues. 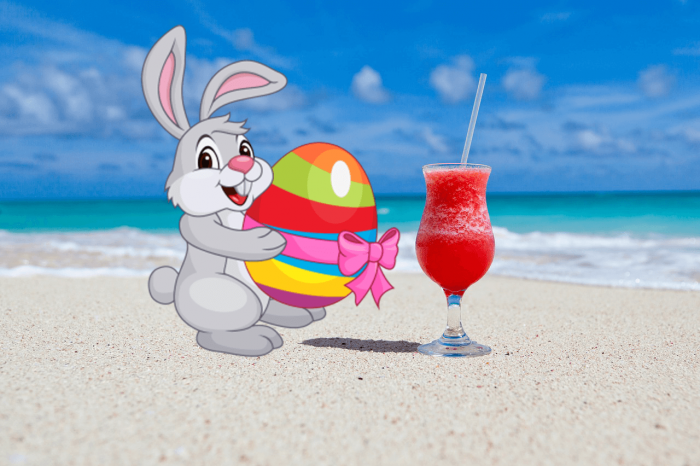 Lobster, seafood feasts, surf ‘n turf and more. 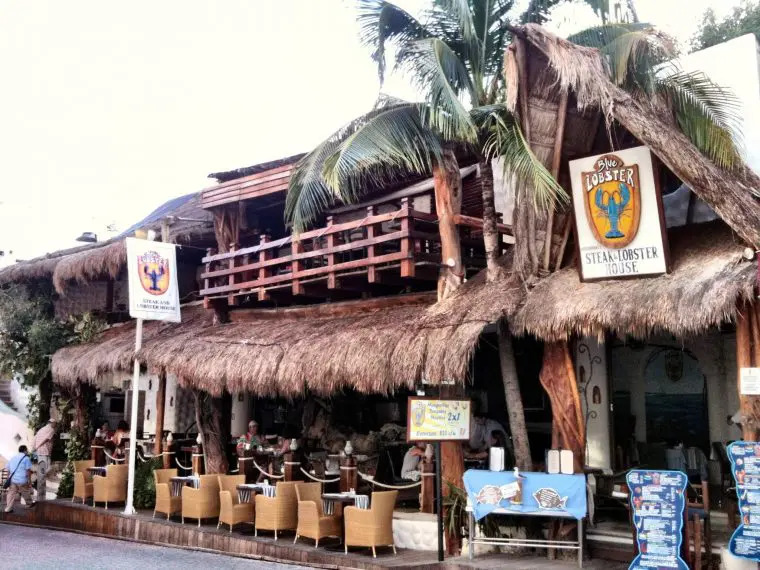 The Blue Lobster in Playa del Carmen is known for delicious seafood and great service. This elegant restaurant is an excellent choice for a special occasion. They do have 2 floors with air conditioning or outdoor seating. 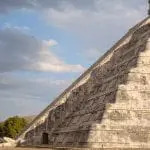 Sunday through Wednesday from 11:00 a.m. – 11:00 p.m.; Thursday through Saturday 11:00 a.m. – 12:00 a.m.
Mexico is definitely a conscious country and you wouldn’t believe how the Vegan and Vegetarian scene is booming here. With an abundance of fresh fruit and vegetables, there’s no shortage of inventive and delightful dishes. 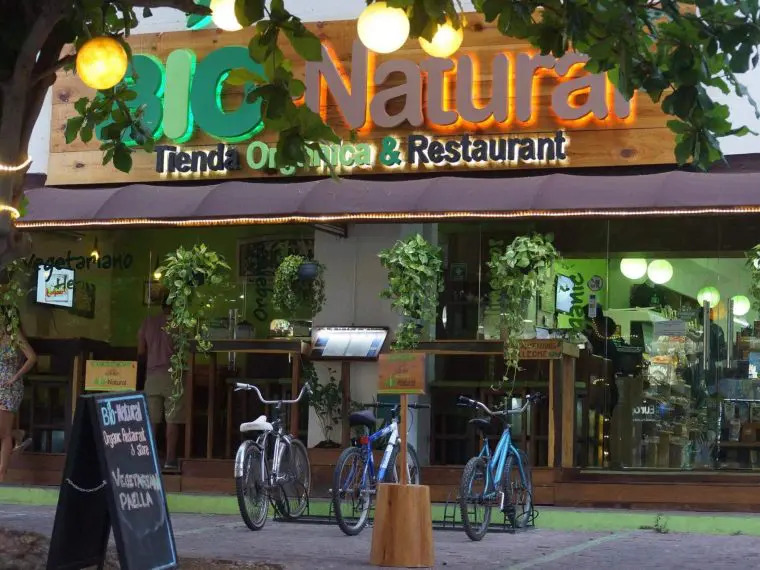 Offering up vegan, vegetarian, and gluten-free options, Bio Natural has to be one of our favorite restaurants in Playa del Carmen. All the produce is fresh and they make healthy feel and taste good. 2. La Senda Vegana – 10th avenue between 10 and 10 bis. 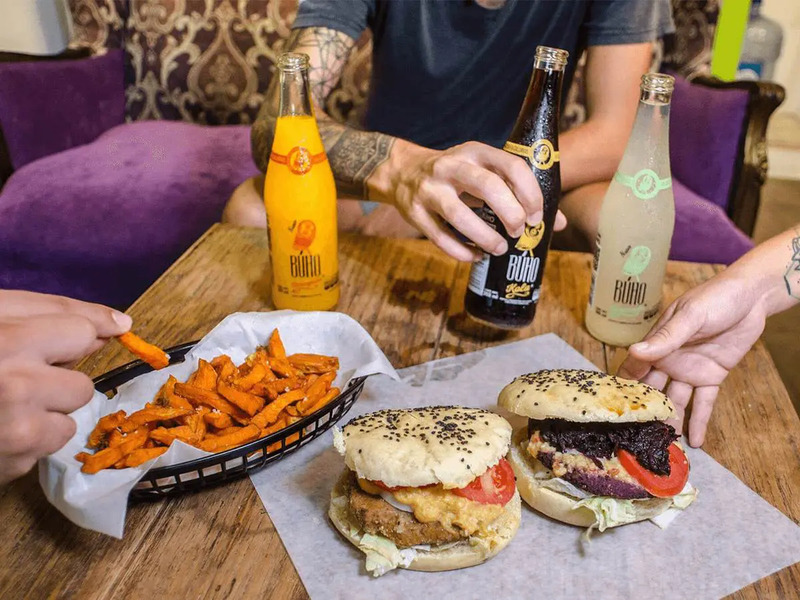 100% vegan restaurant. Tamales, tacos, burgers, pizzas, salads and sandwiches, all without animal-based ingredients. Come experience the great vibe, great vegan food and great prices. 3. Clorofila Green & Vegan – 20th Street and 30th Avenue. Even the name makes you feel healthy, and that’s before even having the pleasure of enjoying the great, natural food products that Clorofila has to offer. From sushi and ceviches to gluten-free pizzas and some amazing desserts, Clorofila leaves you happy, satisfied and guilt-free about the delicious food that you just got to eat. A community center/restaurant/art gallery/whatever you want it to be. El Hongo is an off-the-beaten-path gem that provides nourishment for eyes, soul and belly. The kind people at El Hongo work a lot with the local kids as well, so if you’re looking to donate any children’s books non-plastic toys, this is a great place to do it. Plus, the food is as great as the location itself. (Note: some non-vegetarian items are also on the menu). 2. 100% Natural – 5th Avenue btw. 10th and 12th Streets. This Mexican chain has been serving up healthy options for over 30 years, long before it became mainstream. 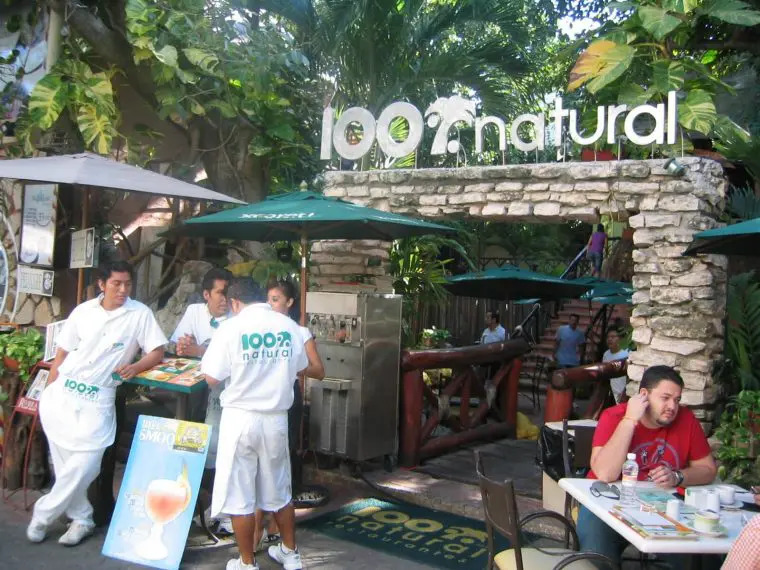 What 100% Natural lacks in a small business atmosphere it makes up for in terms of both quality and location. Situated in the heart of Fifth Avenue, you can indulge in some people-watching and some delicious yet healthy meals all in one sitting. That’s what we call win-win. 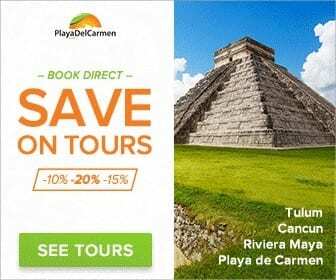 Don’t forget, we offer discounts on fun things to do and hotels in Playa del Carmen. 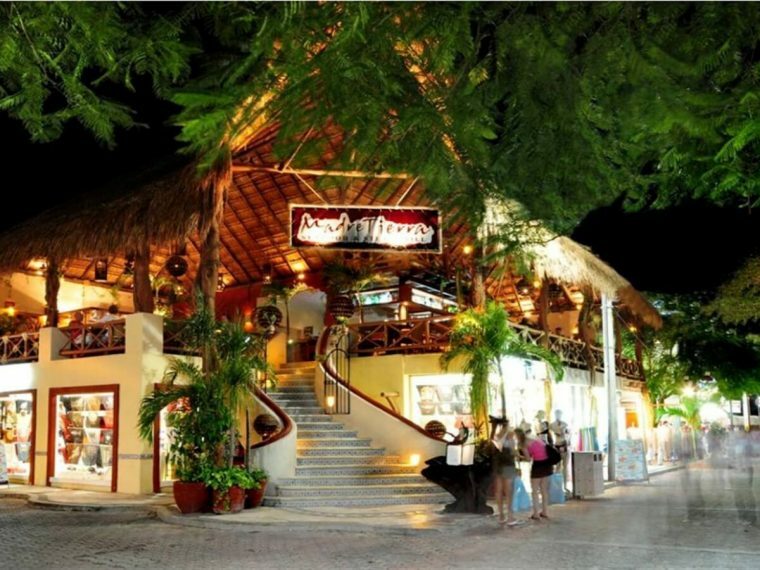 Where’s your favorite place to eat in Playa del Carmen? We love Carboncita’s just north of 5th Avenue asssociated with El Cielo Hotel. The waiters are very friendly and will adapt dishes to customers allergies. They serve drinks on their heads AND the food is great. Well Susan, if they serve the drinks on their head then they DEFINITELY deserve a place on our blog! Whoooosh. Will be sure to check them out soon. Thanks for the info Susan :)! Have an awesome day. Alux Restaurant is our favorite. Private rooms as well as the main dining room, great service, the food is the best and so much to see. Hey Diane, thank you so much for reaching out and for the recommendation. I’ve actually never eaten here before but will be sure to check it out soon. If it’s as good as you say it is I will definitely be adding to our list of awesome places to eat.